School is going so well. We are still learning at the speed of light, but I’m enjoying the content of what I’m learning. I make it a habit to read each chapter at least two times so that I can do well on my tests. When we have several chapters to cover in one week, it throws me off my routine a bit. We have to complete the review questions, do workbook homework, and write the words and definitions on notecards after each chapter. Can I be honest for a minute? I do not want to see another notecard after I’m done with school. Please, I beg of you, keep all notecards away from me! Do you know how many notecards I’ve done up to this point? Six-hundred and one. I know they will be very helpful when I’m studying for the state board theory exam, but if there is one thing that I dislike about being in school, it’s having to do those dreadful notecards. Ugh! There! That’s my confession for the week. Moving right along…this week was full of demos. After each demo, my instructor encouraged us to practice what we learned. Nail shaping appeared to be the easiest of all demos, but when it came time for me to do it, it wasn’t so easy. I had the hardest time with the coffin and stiletto nails, for now, but I will keep working on both. The other demos were on color dropping, marbleizing, and acrylic color mixing. I loved, loved, loved all three of those demos. This is the week that I could not wait to arrive. After looking over the calendar, I noticed that we would be learning about gel application, gel-polish application, and gel-polish removal. I was all ears because I really want to be great at doing gel nails. Before I even started nail school, I was so fascinated at how beautiful these nails are. A few years ago, my daughter came home with gel-polished nails. She was only supposed to get a manicure and regular polish, but her nail tech talked her into getting gel-polish. They were gorgeous. 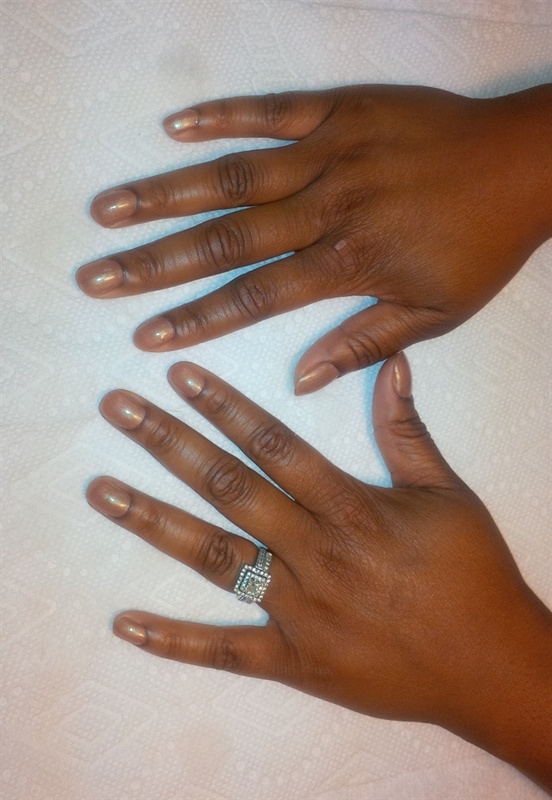 I was not very happy about the price of her manicure with gel-polish, but I was floored by the beauty of her nails. Most of the more seasoned students in my class dislike doing gel nails. My instructor is also not a big fan of doing the gel application. Well, I love it and I plan to practice on it as much as possible until I am satisfied with the results. I did my first manicure with gel-polish on a fellow student. She chose a neutral color because of her profession. I was hoping she would choose some really bold color so that I could really see it better. At any rate, I was super proud of myself. My instructor critiqued my work and gave me pointers on what to do the next time. She said that I did a great job. I have to get myself ready for next week. We have mock board exams and it will be my first time participating. I’ll be back next week to tell you all how it went. Wish me luck. Stay tuned!